Word processing documents in Google Docs cannot presently be edited in the Safari web browser on an iPad “because Mobile Safari does not support contentEditable, which is needed for rich text editing.” (Apple Developer library reference) Office2 Pro is an $8 iPad application which supports editing MS Word and Excel File editing, as well as (currently) very buggy editing of Google Docs. 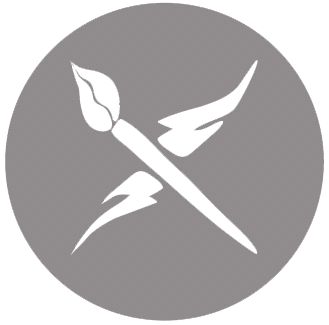 Like Chris Lehman, I bought an iPad to use it for content creation as well as consumption. The 1.5 pound weight of the iPad has won my heart, along with its impressive functionality. I NEED to be able to edit Google Docs on it, however, since 95% of my productivity application use takes place in Google Docs, Google Spreadsheets, and Google Presentations. 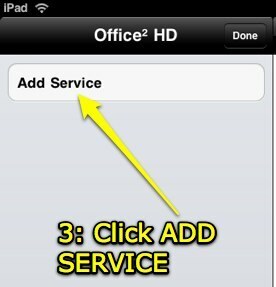 Despite Kevin Tofel’s cautionary post last week about Office2 Pro on the iPad being buggy and not YET fully functional, I went ahead and purchased the application last week to give it a try myself. My conclusion mirrors his: DO NOT purchase this application YET if you’re wanting a good way to use Google Docs on the iPad. Hopefully the app will be updated soon to provide seamless functionality, but for now it’s buggy and not worth the money if Google Doc use is your goal. 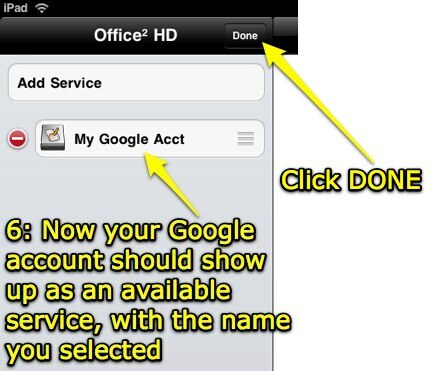 In this post, I’ll highlight how to connect Office2 Pro to your Google Docs account, and the CURRENT results when editing documents. 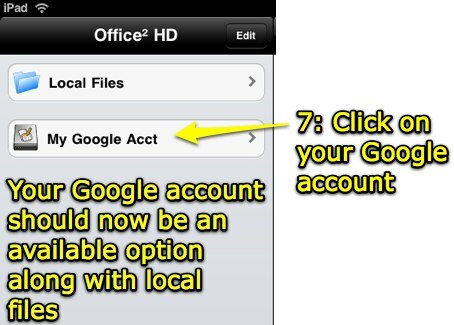 The Help documentation provided within Office2 Pro includes some guidance about configuring your Google account within the application, but the steps are not thorough or very clear. Make sure you are viewing the application in LANDSCAPE mode to begin. Step 1 is to click the BACK button. Step 2: Click the EDIT button. Step 3: Click ADD SERVICE. 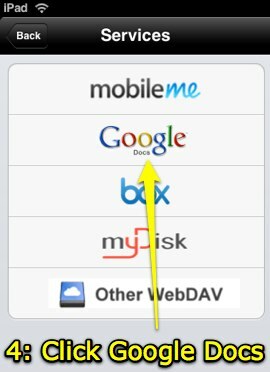 Step 4: Click GOOGLE DOCS to add it as a service. 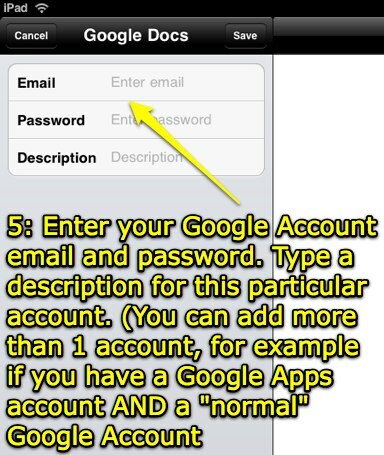 Step 7: Click on the name you provided as a description for your Google account. 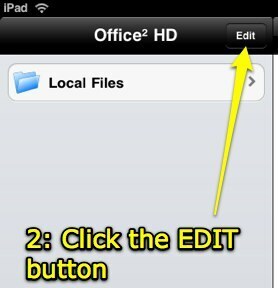 Step 8: Click on an existing document you want to edit, or the “+” symbol to add a new document. 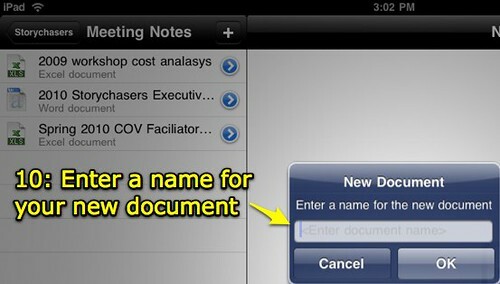 Step 10: Enter a new name for your document. 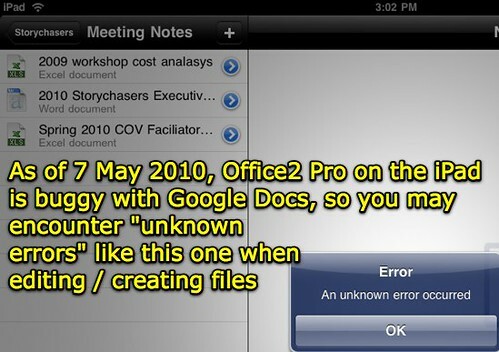 “Unknown errors” unfortunately appear to be common with this version of Office2 Pro and Google Docs. 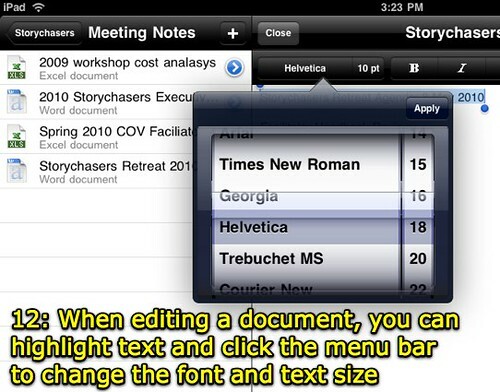 Step 12: Select text as desired and choose font type and text size from the menu bar, using your finger. Step 13: Select formatting options as desired, including bulleted or numbered lists. Note the formatting menu bar can be “slid” to reveal a second set of formatting options. 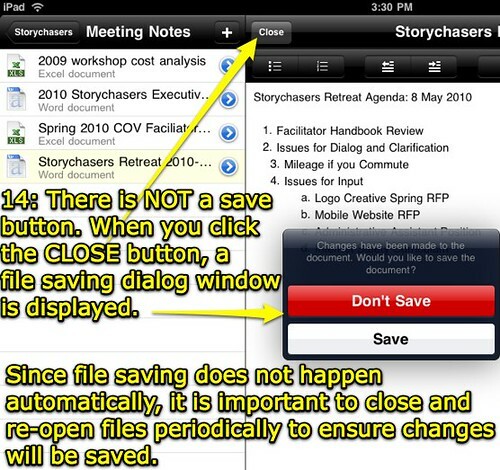 Step 14: Since a SAVE button is not available, you must click CLOSE to save the document. 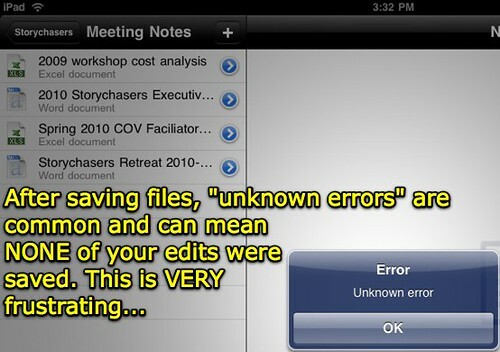 Step 15: “Unknown errors” are common, so save often. I hope the application will be updated soon and this buggy behavior with Google Docs will be fixed. 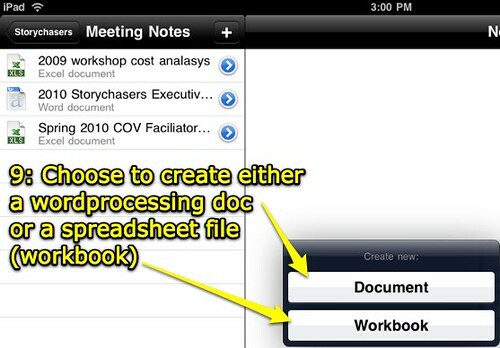 It’s GREAT the application developers are working to create an iPad environment which will enable editing for Google Doc word processing and spreadsheet files. Thanks for the great product review. Like you, I am trying to move as quickly as possible to me iPad for productivity. The Google Docs issue is a big one (as is wireless mouse support for me). 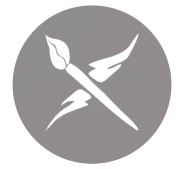 Thanks for the writeup. I’ve been deliberating this as well. Will you repost if/once they get it working better? It’s *so* close to what we need… that’s what is starting to drive me nuts. 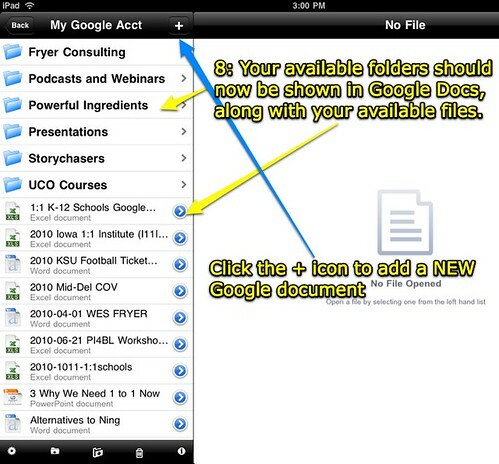 I purchased “Docs to Go” in order to edit Google Docs on my iPhone. It seems to work fine. It did cost 15 dollars on special. I wonder if it will work on the iPad. Has the app been updated at all? Does it work with docs created with the new editor? I wasted $15 on Documents To Go Premium only to find out that it doesn’t work with Docs’ new editor. I’ve resolved to read more reviews in the future. I actually haven’t used the app much at all since I wrote this review in May. I need to revisit it. 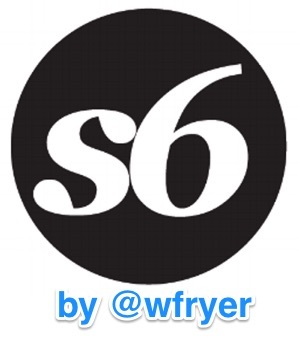 I just downloaded an update for it this weekend, so to your question… yes, it’s been updated. I can’t vouch for the functionality of the update, however. I have just taken ownership of my first iPad and have already hit the same frustrations as you. We use Google Docs almost exclusively in our organisation so its really annoying to not be able to edit our documents easily on the iPad. However, the potential (if Office2 or even Google) can get it right is fantastic. Even editing Google Docs on a browser doesn’t work properly and has massive bugs so for now i’m just going to have to keep hold of my laptop to do any major document work and just use the iPad to draft letters. Perhaps i’ll use it to write my first book!